Jumping out of a perfectly good airplane has never been high on my bucketlist. I’ve been told it’s the most amazing experience, but I’m still not convinced it’s for me. However, when I learned you can experience the thrill of free falling in a safe and controlled environment, I will admit that my interest was piqued. 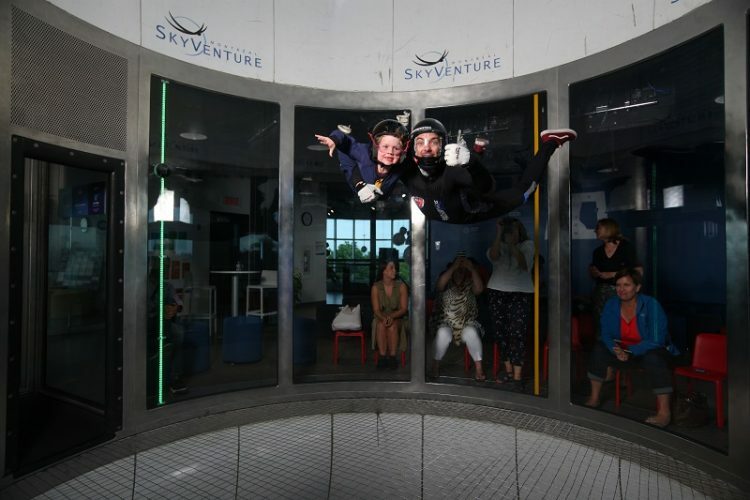 While in the city Laval, located just outside Montreal, Braydon and I were invited to try Indoor Skydiving at SkyVenture Montreal. It’s a family friendly activity that allows guests to feel what skydivers feel during the free fall portion of the skydiving jump. The technology that powers this indoor skydiving experience is truly amazing. When we arrived, the check-in process was easy and quick. We were directed to an online screen where I entered our information. After I finished the paperwork (make sure you bring ID for everyone who’s going to fly), we were weighed in and then directed to the second level of the building where we were able to watch other people flying in the wind tunnel. Our nervous excitement kicked in when we witnessed the other guests in the tunnel. Braydon took a front seat on the floor and watched the others carefully. He looked confused by what he was seeing. And rightly so. It’s not everyday you witness people flying! We had 10 minutes to watch the others before we met our instructor, Fred. We watched a 5 minute safety video and Fred answered our questions. I felt much more comfortable after speaking with him. Fred showed us how to position our body while in the air and how to properly enter and exit the tunnel. It’s very loud inside the tunnel, so you are not able to talk one another. Fred showed us the various hand signals that are used and what they meant. The goal is to fly on your own, unassisted, as much as possible. After our safety briefing it was time to get suited up. SkyVenture Montreal provided us with a special suit to wear, and, if needed, proper shoes that would not fall off. We also had to wear ear plugs. We were provided a locker to store our valuables. We were advised to take off our earrings, rings and anything that could easily fly off. Helmets and special goggles are also provided. As we walked towards the tunnel, I noticed Braydon was hanging back. I asked him what was wrong and he said, “I want to go last.” Understandable. I sometimes forget that he’s only 6 years old. So we hung back and positioned ourselves to be the last group. Unfortunately, my plan backfired. The last person entering the tunnel was actually seated closest to the entrance – which was Braydon – and this person becomes the first in line. Whoops! I am so proud of him. It was such a special moment for me. He conquered his fear and embraced being outside of his comfort zone. The wind was turned on and Fred, our instructor, held out his hand. Braydon grabbed Fred’s hand and within seconds his feet lifted off the ground. He was flying! Braydon is flying all by himself! This smile didn’t leave his face the entire time he was in the tunnel – he loved every minute of it. I entered the tunnel, put my hands up over my head, and let myself fall forward. Fred grabbed hold of me and within seconds I was flying on my own, too. It was so cool! Fred continued to direct me with his hand signals and I slowly learned how to maneuver inside the tunnel. Indoor skydiving is a LOT harder than it looks. I wasn’t inside the tunnel for long before my body started getting tired. It’s quite the workout. Once everyone in our group completed their first turn, we each went into the tunnel for a second round. But this time was a little different. Before we entered, Fred asked for a thumbs up or down. We all gave the thumbs up, which meant at the 30 second mark, he was going to help us fly to the top of the tunnel. I would estimate the height of the tunnel to be 30 feet in the air! I entered the tunnel, trying to keep my body in the right position, and at the 30 second mark Fred grabbed the holders on my bodysuit and up, up, up we went. This is likely the closest I will ever get to free falling. It was so much fun! Braydon gave everyone watching a big thumbs up. He had a great time. After everyone had their second turn, Braydon was the lucky one to get 30 seconds more. He was so excited that he was the only one to go 3 times. It paid off that he went first. Watch us learn to fly in the video below. 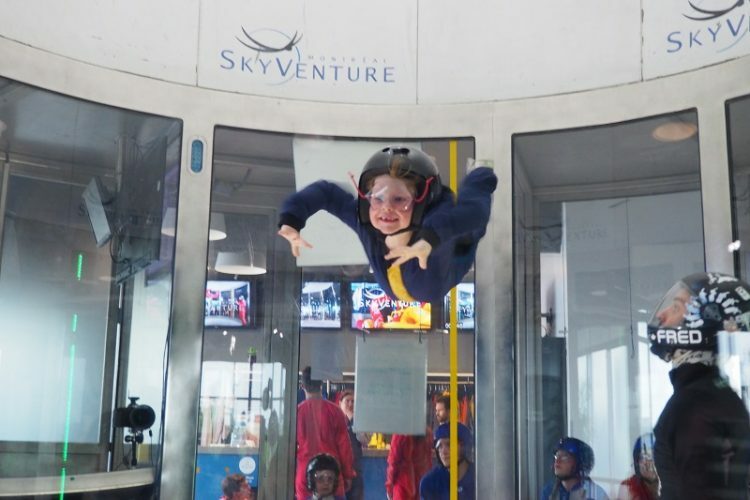 Packages for indoor skydiving can be purchased for 2, 4 and 10 flights. More info here. 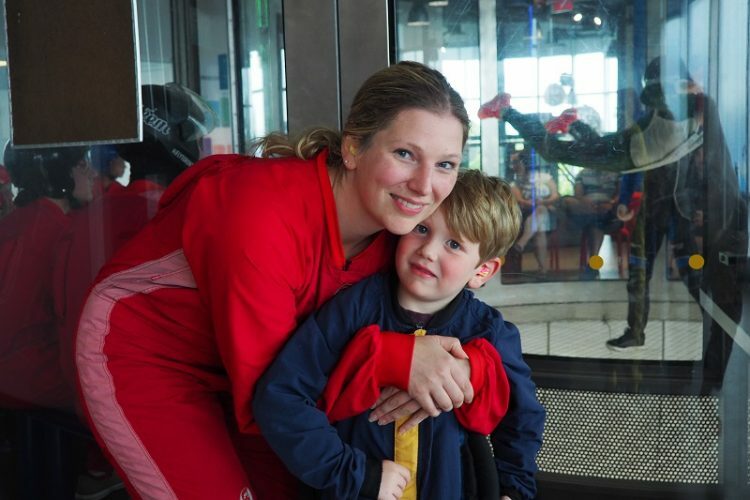 We did the 2 flight package and it was the perfect introduction to indoor skydiving. We would definitely do it again if we lived close to the facility. 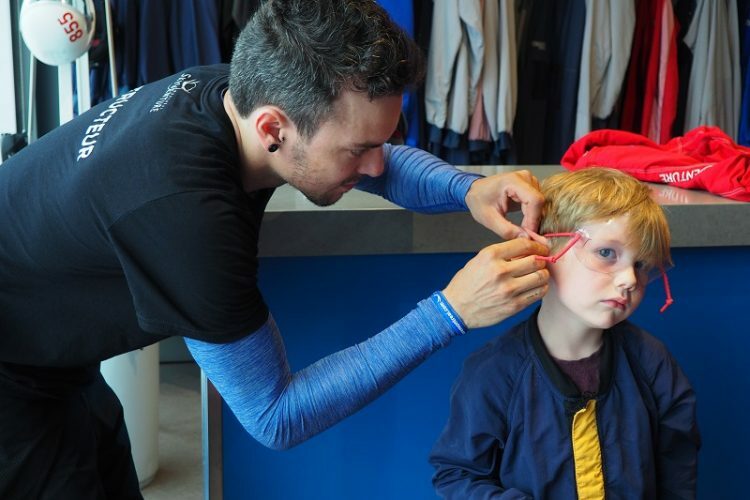 When speaking to our instructor, he mentioned that a SkyVenture was opening in Vancouver, British Columbia soon. That would be great, as I know Cameron and Connor would have a blast, too. 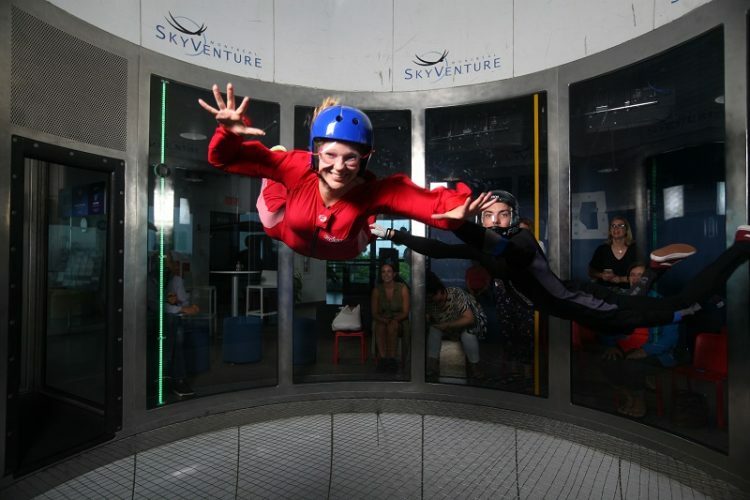 Have you tried indoor skydiving? Did you like it? Disclosure: we teamed up with Quebec Original in order to make this trip possible. 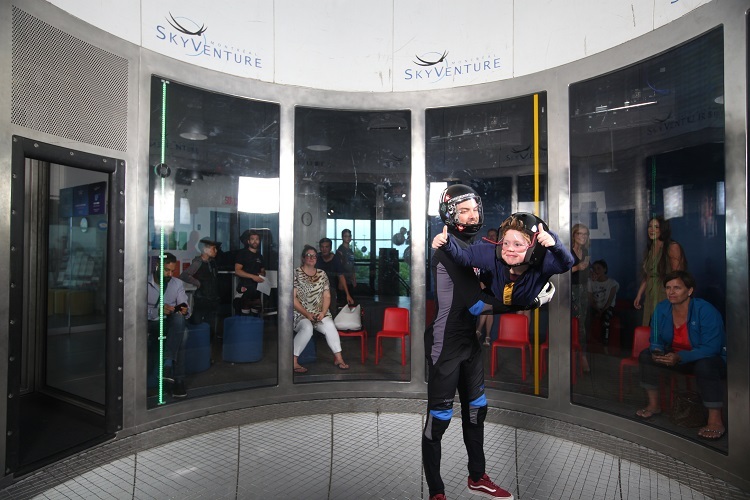 Our indoor skydiving experience was complimentary. We agreed to share our honest, firsthand experience on this blog and social media channels. Read our disclaimer here and see our previous campaigns here. Fantastic wrap up of your experience. You covered all the bases and the tips you gave for new flyers are spot-on. The most important thing I’d add would be to listen closely to your instructor, they are there to make sure you have a great time, not to hold you back!